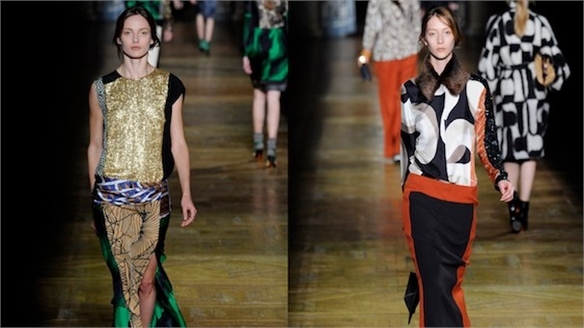 Belgian fashion designer Dries Van Noten showed his Spring/Summer 2012 collection on the first day of Paris Fashion Week yesterday. The designer’s signature use of prints manifested itself through natural landscapes, florals and exotic palm-leaf prints with a retro feel. Elsewhere, print abstractions were taken from photographs by James Reeves, one of the finalists in the 2010 Hyeres fashion festival's photography competition, of which Van Noten was president of the jury, offering a glittering skyline of lights. Las Vegas signage and several variations on night-lit cityscapes created a post-modern take on the urban jungle. In terms of silhouette, boxy oversized jackets were paired with wide-cut trousers skimming the ankle. Channelling a mid-century couture line, with swing backs and ruffled details, Van Noten also emphasised the hips with an expressive curved line reminiscent of New Look shapes. Particularly strong was his interpretation of the peplum – in Dries Van Noten's world the detail was dropped at the waist and effortlessly integrated into relaxed straight-leg trousers. 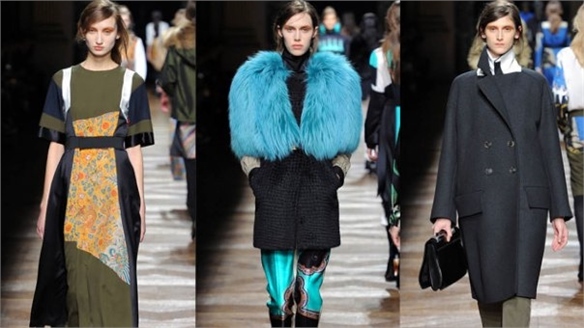 Pencil skirts and dresses were hemmed either just above or just below the knee, while the monochrome palette was highlighted with ginger, turquoise and teal. Retro pastel sunglasses and wraparound ribbon-tie black shoes finished the collection with a touch of Riviera glamour. 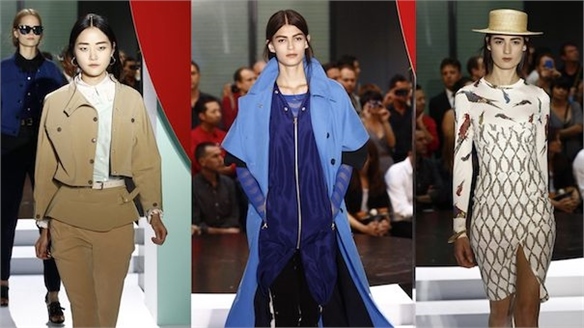 Paris Fashion Week runs until October 5. PFW A/W 12-13: Dries Van Noten PFW A/W 12-13: Dries Van Noten The allure of the exotic was a key interest for Belgian fashion designer Dries Van Noten as London’s Victoria and Albert Museum provided multiple Asian prints and motifs for his Autumn/Winter 2012-13 collection, shown yesterday at Paris Fashion Week. 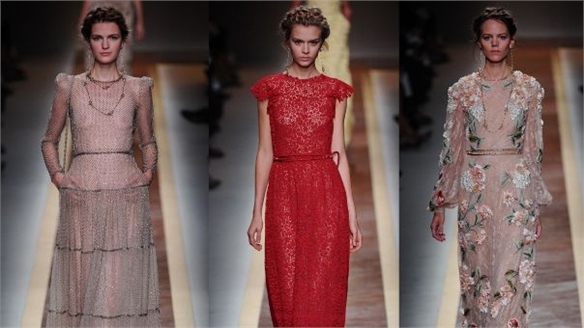 PFW S/S 2012: Valentino PFW S/S 2012: Valentino Pier Paolo Piccioli and Maria Grazia Chiuri’s latest collection for Italian fashion house Valentino was a showcase of graceful, ladylike dresses in weightless fabrics and finishes. PFW S/S 2012: Chanel PFW S/S 2012: Chanel The Grand Palais in Paris was transformed into a sprawling white undersea kingdom yesterday, as Karl Lagerfeld unveiled the ocean-inspired Spring/Summer 2012 collection for Chanel. 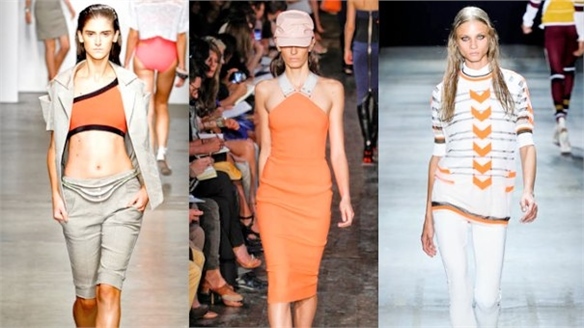 PFW: New Appointments PFW: New Appointments Spring/Summer 2012 marks the debut collections of a number of new designers taking the reins at significant Paris fashion houses. 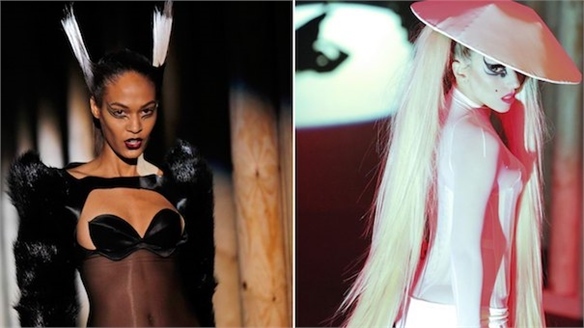 Some of the most notable at Paris Fashion Week include Bill Gaytten at John Galliano, Yoshiyuki Miyamae at Issey Miyake, and Gabrielle Greiss, formerly of Sonia Rykiel, presenting her own womenswear line. PFW S/S 2012: Kenzo PFW S/S 2012: Kenzo Newly appointed creative directors Carol Lim and Humberto Leon of NY-based retailer Opening Ceremony debuted the Spring/Summer 2012 collection for French fashion house Kenzo at Paris Fashion Week. 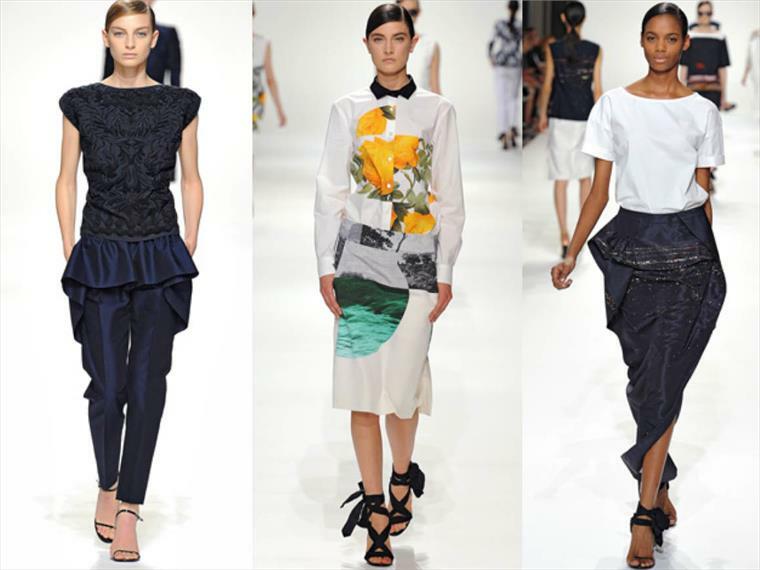 PFW S/S 2012: Balenciaga PFW S/S 2012: Balenciaga Designer Nicholas Ghesquière's latest presentation for Balenciaga showcased his talent for proportion and ability to elevate simple items like jeans and white tees to haute heights. 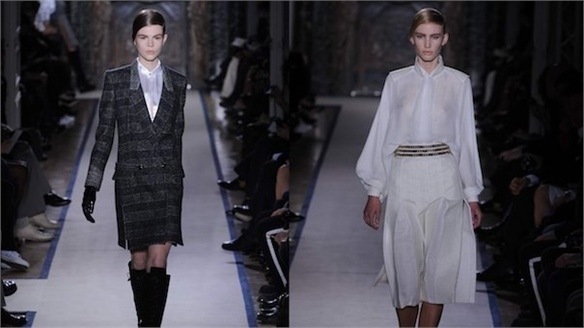 PFW S/S 2012: Rochas PFW S/S 2012: Rochas Citing a cluster of cinematic references, Paris fashion house Rochas showed its Spring/Summer 2012 collection at Paris Fashion Week yesterday. MFW S/S 2012: Roberto Cavalli – 40 Years of Glitz MFW S/S 2012: Roberto Cavalli Celebrating his brand's 40th anniversary, Roberto Cavalli showed his Spring/Summer 2012 collection at Milan Fashion Week yesterday. 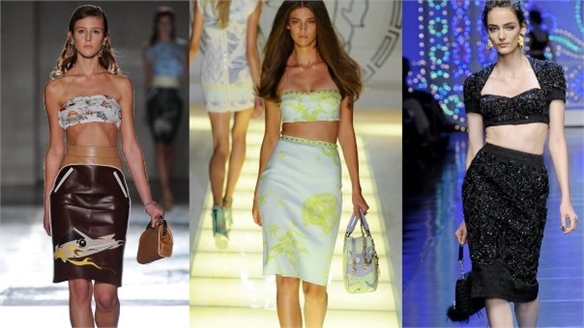 MFW: Midriff Matters MFW: Midriff Matters The midriff was the key erogenous zone in Milan, with numerous designers sending bare waistlines down the Milan catwalks. 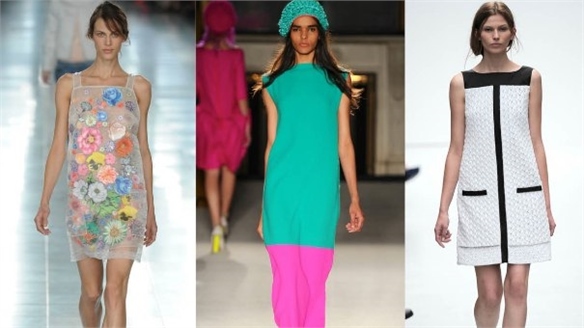 LFW: Waist Not, Want Not LFW: Waist Not, Want Not One clear trend to emerge from London Fashion Week was the move away from accentuating the waist, looking to retro shift silhouettes and drop waists instead. 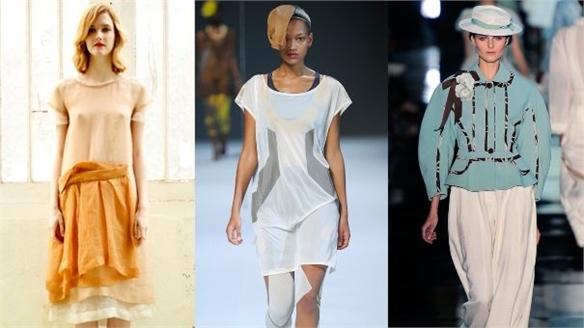 NYFW: Sheer Delights NYFW: Sheer Delights The allure of the sheer overlay had not been overlooked by the designers showing their Spring/Summer 2012 collections at New York Fashion Week. NYFW S/S 2012: Proenza Schouler NYFW S/S 2012: Proenza Schouler Jack McCollough and Lazaro Hernandez, the New York-based duo behind Proenza Schouler, presented a vintage-inspired collection for Spring/Summer 2012-13 at New York Fashion Week on September 14 2011. 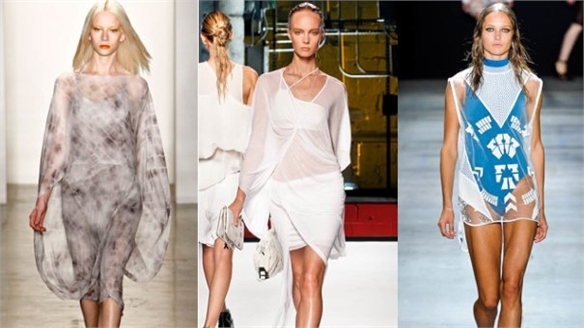 NYFW S/S 2012: Theyskens' Theory NYFW S/S 2012: Theyskens' Theory Since Belgian fashion designer Olivier Theyskens launched the Theyskens’ Theory brand in 2010 in partnership with CEO of Theory Andrew Rosen, the label has gone from strength to strength, attracting a host of modern, female fans with its laid-back look. 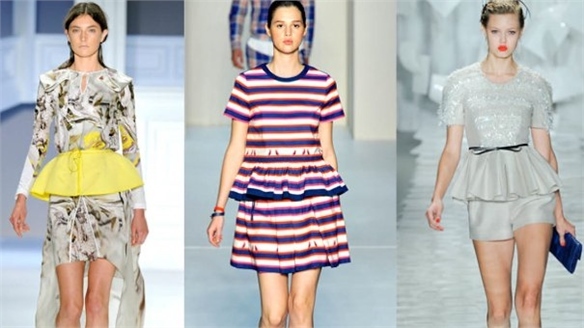 NYFW: Peplum Power NYFW: Peplum Power One of the key silhouette details to emerge so far from NYFW is the peplum – an oversized flounce or ruffle positioned at the waist. 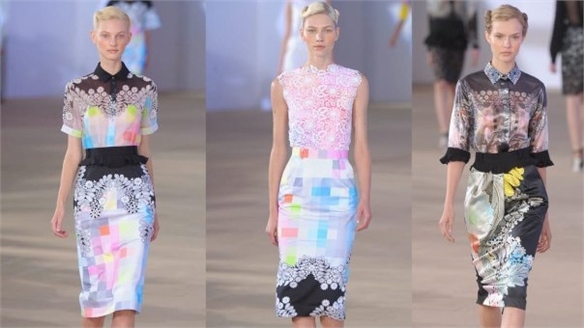 NYFW S/S 2012: Preen NYFW S/S 2012: Preen Playful pixelated prints met ladylike silhouettes for Preen’s Spring/Summer 2012 collection, which showed at New York Fashion Week yesterday. NYFW: Game On NYFW: Game On New York Fashion Week has been showing its competitive streak this season, with numerous designers sending sports-inspired collections down the runway. Louis Vuitton: Paris Fashion Week A/W 2011-12 Louis Vuitton PFW A/W 11 Showing his new collection for Louis Vuitton in Paris yesterday, designer Marc Jacobs clearly had fetishism on his mind. 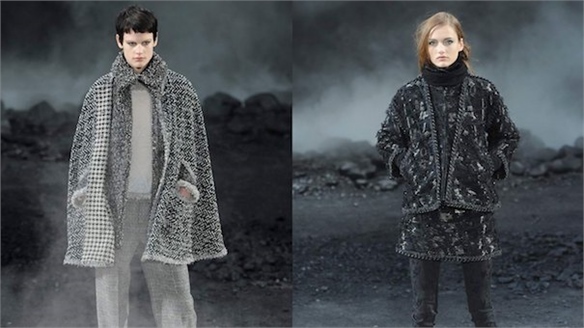 Chanel: Paris Fashion Week A/W 2011-12 Chanel: PFW A/W 2011-12 High drama unfolded at Karl Lagerfeld's Chanel autumn/winter 2011-12 show in Paris yesterday. YSL: Paris Fashion Week A/W 2011-12 YSL: PFW A/W 2011-12 Yves Saint Laurent designer Stefano Pilati showed his autumn/winter 2011-12 collection in Paris yesterday. 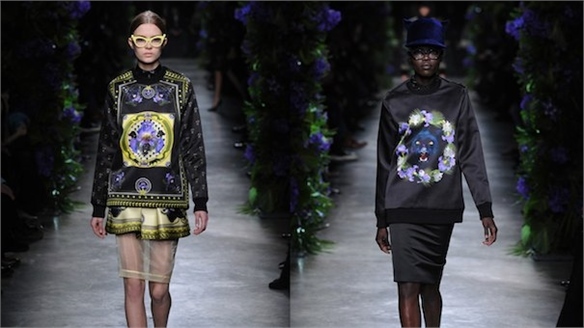 Givenchy - Paris Fashion Week A/W 2011-12 Givenchy: PFW A/W 2011-12 Amid rumours that designer Riccardo Tisci is set to take over from the recently-ousted John Galliano at Dior, his Autumn/Winter 2011-12 collection for Givenchy was shown in Paris yesterday. Haider Ackermann: A/W 2011-12 Haider Ackermann: A/W 11 Designer of the moment Haider Ackermann showed his new collection in Paris on Saturday. 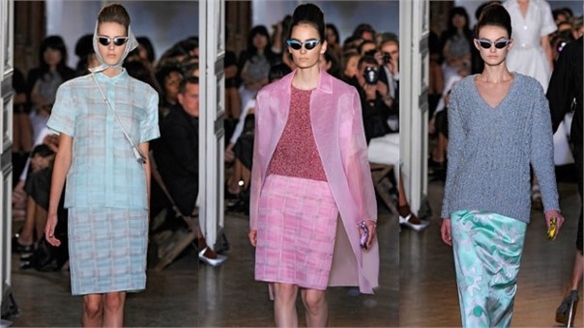 Named by Karl Lagerfeld as his preferred successor to the Chanel empire, Ackermann wowed editors with what Style.com described as "what might be the show of the season". Mugler - Paris Fashion Week A/W 2011-12 Mugler: PFW A/W 2011-12 Nicola Formichetti's Mugler womenswear debut starred chum Lady Gaga strutting to her brand new single Born This Way. Striking animalistic poses, Gaga smoked her way down the catwalk in a futuristic black bodycon number for full-throttle fashion entertainment. Dries Van Noten: Paris A/W 2011-12 Dries Van Noten A/W 2011 Citing rock icon David Bowie and the Ballets Russes as his primary influences, Dries Van Noten showed his latest collection in Paris yesterday.